Firstly, when you receive the race pack, you'll be struck by the lack of the usual stack of flyers/coupons. Sure, I'd spend 10 minutes sifting through and throwing most of them away, but it was a good omen and part of the fun. The most valuable item there IMHO is a book titled 'The Pain-free Desk Warrior' by Dr Gary Tho. Says something if your best souvenir from an urban race is a book. Now onto the actual race. Inspired from the never-ending walls at Spartan Race and the low wall of army standard obstacles course (SOC). Guys who've been through NS would have an idea of how to get through this, with the more lithe ladies following suit. The wooden barriers surprisingly won't break, but what might are your shins at the hard landing on the other side. You can probably walk through this as easily as its namesake sidewalk. Sure it's a little shaky, but that's probably due to the plus size guy blocking your way. Gets a bit tricky when the hand rails and foot rests are narrower at the end. But it's okay, the safety mattress is near the start so you'll get a deserving bruise if you fall. Oh, this looks like it might need some arm strength. Might I remind you that you probably did this when you were a kid at the playground. It probably feels heavier due to the weight of your responsibilities. And your couch potato habits. 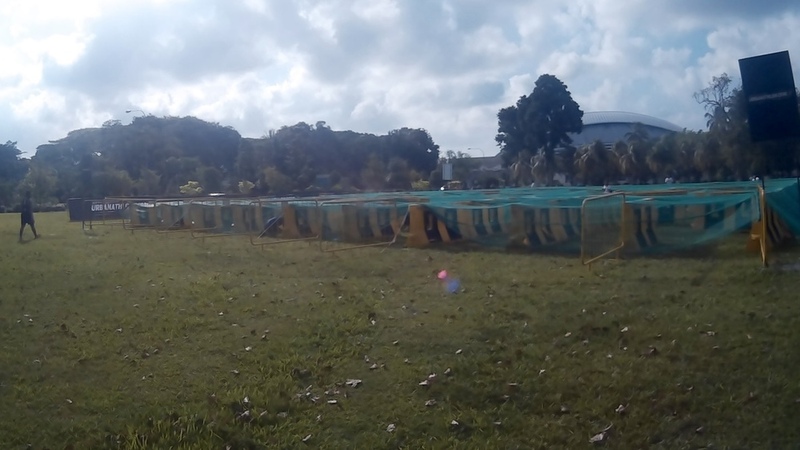 The first few obstacles were 1 - 2km apart, a comfortable pace from each other. Then you hit this stretch and you wish you brought your EZ-Link card with you. As the sun comes up with no water point in sight, you begin to hallucinate and doubt if you signed up for the Urbanathlon or the Standard Chartered Marathon Singapore. Another one taken off the old SOC. It only seems hard when you're worn from the run. Else a clear head and a bit of elbow grease would get you through it. There's some magic in the air that morning. The first person who did this had to toss a 20kg sandbag. By the time the last person tossed it, it magically turned into a 50g airbag. Then it's just a matter of rolling yourself over the barriers and stroll to the next obstacle. The name would get you excited, hoping to find some intricate labyrinth with monsters hiding. The only monster you'll find is your disappointment at the end of paths high enough for you to get through by bending over (hooray for short people). Oh, and maybe the dangerously sharp mimosa weeds if you happen to crawl. An Urbanathlon staple, it's one of the most picturesque obstacles. The challenge here is to strike the most glamorous pose as photographers on both sides are peeking for an up skirt snapshot from underneath. And to protect your family jewels if you slip in between. This is more of a warm down station than an obstacle, which you'll see why when you get to the next one. As you go through 5 simple CrossFit exercises, you'll wonder why you had to pay for this. There better still be beer when you finish this. A more apt name for this obstacle is Test of Patience. Want to know how well you fared in a 14km run with obstacles? Too bad, you don’t know whether you’ve been queuing for 20 mins or an hour just to climb up a scaffolding and zip line down shorter than your primary school camp. To cool off, you jump off into a pool of sweat from previous participants who’ve been roasting under the noon sun. Once you’re past that madness, there’s a whole slew of things to do at the race village. It’s time to get your money’s worth with the buffet and freebies. Every booth has something to offer, like Adidas merchandise for doing box jumps and a body fat analysis by Virgin Active for being brave enough to measure it in front of a crowd. And of course, the biggest attraction, the free-flow beer garden. If you fancy having a pint in the middle of the day, you can fill up on Singha for as long as the event is running. Go ahead, replenish all those calories lost during the run. 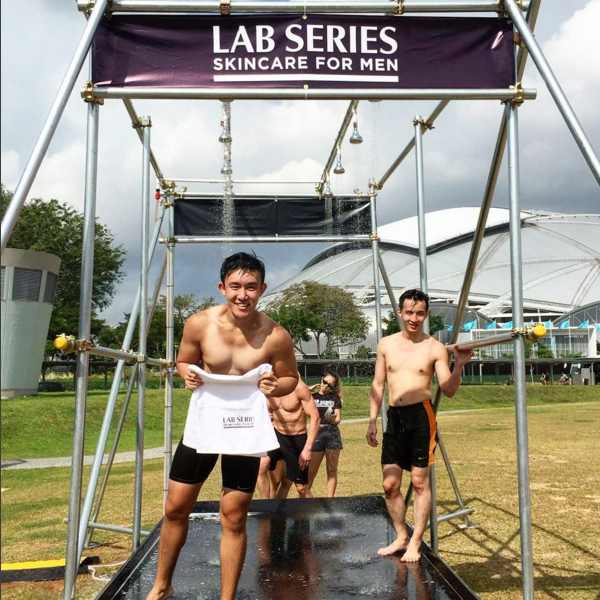 In a brilliant marketing gimmick, Lab Series promoted their product with a live demonstration. Step into their open shower where their girls lather creamy white stuff to you and offer a free towel. They’re just stopping short of stepping in and getting wet along with you. 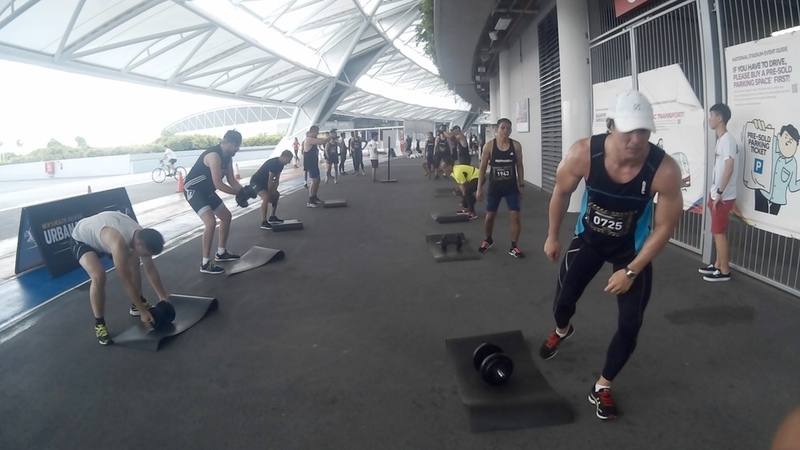 Urbanathlon has more to offer than just a mundane 14km run. The obstacles sure break up the monotony and you get a fair bit of bang for your buck relative to other races. Though if you’re actually paying for a challenge, you’re better off keeping your wallets and doing a circuit around the West Coast Park playground. As fun as it is, this is but a warm up for the real challenge in May.